The Model 2348 is a compact but robust power amplifier designed for applications that require moderate voltage amplification and high current beyond the ranges of arbitrary, function, sweep, or pulse generators. The 2348’s current capabilities make it ideal as a buffer for signal generation devices used in solenoid or magnetic excitation. This unique amplifier meets requirements for MEMS testing, transducer characterization, and pulse applications. Its high voltage stability and low noise characteristics also meet the demands of mass spectrometry and related scientific applications. A continuous current of 750 mA is available at voltages up to 50 Vp-p. This provides 18.75 watts of AC or DC output power to 500 kHz. The instrument’s bandwidth ranges from DC to 2.0 MHz. 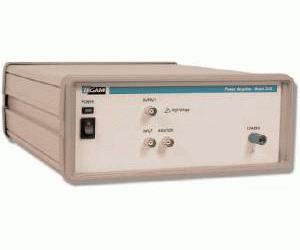 All of this performance is packed into a compact, rack-mountable chassis no larger than a typical function generator. Built in Protection Output current is sensed in either polarity by the 2348’s built in current limit function. The 2348 power amplifier is equipped with thermal shutoff to protect against overheating. This maximizes protection to the amplifier’s circuitry in the event of an external fault. The main output is isolated from ground. A binding post is provided on the front panel for a direct chassis ground connection. An independent, buffered, voltage monitor output is provided for applications that require a low-level representation of the output signal such as in closed loop applications. The monitor output reduces the output signal to 20:1 for 50 Ω inputs and 10:1 for inputs exceeding 1 MΩ. The Model 2348 is a cost-effective solution for specialized applications where low distortion and precision is required. The 2348 is ideally suited for high frequency, power applications that require voltage amplification with an abundant supply of current.